How do you choose a payment form to suit your business best? Read on to find the differences between Checkout and Custom Form and see which of these solutions has all you’re looking for. We hope that you’re doing well. Today, we’re going to be talking about payment forms. We’ll start out talking about existing payment forms, the as is situation and then, we will jump into SecurionPay Payment Forms. We’ll talk about Custom Form, Checkout, a bit about the future and, at the end, we will summarise everything. So, what happens nowadays with existing payment forms? You’re on a website and you decide that you want to purchase something. You click on ‘Pay’, and what happens? You get redirected to another website. Not only this is a stone age process, but the data clearly illustrated that your customers have a poor shopping experience through this. What’s more, you lose control of their behaviour through that process. And, most of the time, it’s not mobile friendly. 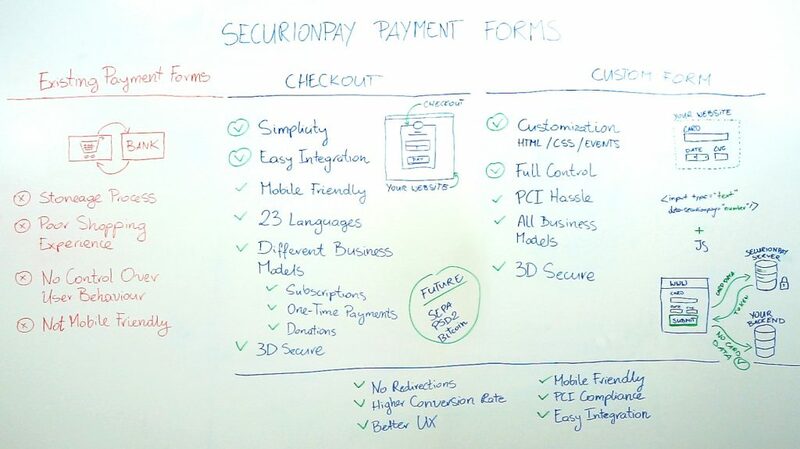 So, what does SecurionPay have to offer with their payment forms? Well, we have Custom Form — think customization, and Checkout — think simplicity and ease of integration. When it comes to Checkout (more about Checkout integration and features), the customer is on your website and they decide they want to pay something. There are no redirections, our Checkout screen overlays in an iframe on your existing website. Your website is still visible in the background, giving them that experience that you want to offer them. We also know that it is mobile friendly, we’ve tested it on over a thousand devices. We have it in 23 different languages, giving your customers that local shopping experience that we all love and crave. 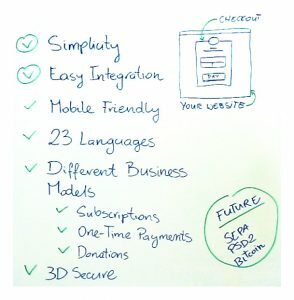 We support different business models, such as subscriptions and one-time payments ad, of course, 3D Secure. When it comes to the future, there’s a lot of European directives and regulations ongoing, such as SEPA and PSD2 — We are well-prepared for that. And when it comes to alternative payment forms, we’re also having Bitcoin to come. Now, when it comes to Custom Forms (more about Custom Form integration and features) — the customer is still on your website. We understand that your front-end developers and your designers have spent a lot of time, and a lot of resources to create that experience that your customers want. We don’t want to interfere with that process whatsoever. So, we came up with a quick fix. You take a bit of our code, put it into your HTML, add a little java script and when the customer clicks on ‘Pay’ or ‘Submit’, the card data gets sent to our SecurionPay servers. We tokenize it, we get rid of the card data, and it gets sent back to your backend — Great, no? Not only does this give you full control of the events in the payment process — you can see errors and other things like that. But, all the PCI hassle is on us. All the security and confidentiality — don’t worry about it. 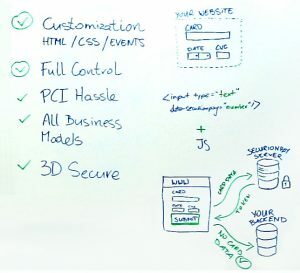 Again, we support different business models and we offer 3D secure. 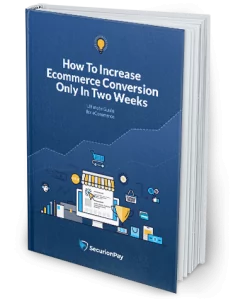 To summarize, SecurionPay, with their payment forms offers you no redirections, higher conversion rates, a better UX experience. They are mobile friendly, they are PCI compliant and very easy to integrate. Thank you so much for your time, and enjoy the rest of your day!